The term "Higher Plants", roughly said, covers all plants which can be "planted": all trees, shrubs, flowering herbs, ferns and fern relatives. The separation into Higher Plants and Lower Plants is based on reasons more traditional and practical than fundamental. Moss-like plants and Green Algae are closer related to the Higher Plants than to the vast variety of the other Lower Plants which they have been assorted with. Higher Plants are also called "Vascular Plants", which refers to a level of organisation distinguished by the presence of special tissues, notably those facilitating transport inside the plant. There are good reasons to assume that all Higher Plants have evolved from some species of early terrestrial plants of a Silurian flora similar to the well preserved Lower Devonian flora of the Rhynie chert with its 7 Higher Plant species found hitherto. 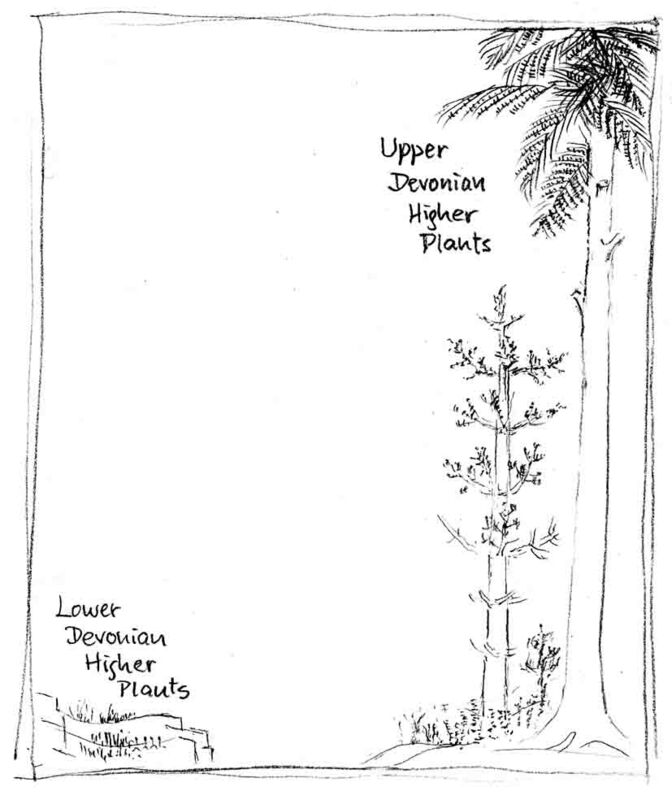 The small leafless plants of the Lower Devonian had developed into impressive trees by the end of the Devonian. This amazing development greatly changed the aspect of the Earth. Beautiful illustrations of Devonian landscapes are shown in "When Fish Got Feet ..." by Hannah Bonner . The moss-like plants never made it much above the ground, so they were left on the other side of the artificial divide separating Higher and Lower. The Higher Plants are often simply called Land Plants although quite a number of them have returned to a submerged way of life, and some have even developed an alga-like aspect, fitting to their habitat. The terminology is confusing since several small alga species have managed to live on dry land, and a few descendants of the big Higher Plants of the Palaeozoic have reduced their size greatly so that the smallest Flowering Plant is now a mere green lenticular blob of 1mm across.